Rather than enjoying later life, Britains babyboomers are taking on more and more worries, reveals a new study by Astral, the all over hydrating body moisturiser, loved and used by millions of British women. With female babyboomers set to live longer, up to 85 years on average, life and work worries are now overshadowing their prime. According to Astrals new report , health concerns (50%) topped the list of worries, followed by family woes such as children and ageing (40%), then finance (30%) followed by the state of the world (25%). .The menopause was linked to the majority of womens health worries and confidence issues, as they struggled to handle its symptoms and the impact on their home and extended work lives. Almost half (45%) of the study said they suffered a lack of energy, with three quarters (75%) feeling physically tired and 45% only managing to do essential tasks, but not having enough energy for anything else, thanks to the menopause. Embarrassing problems associated with the change also presented further hurdles, with hot flushes affecting almost everyone (90%), and digestive upsets effecting 85% on a regular basis. Irritability was another factor that women found hard to control and impacted their extended working lives, with 60% seeing a distinct downturn in their mood thanks to the menopause. Beautiful, youthful skin plays a large part in feeling beautiful. Almost all of the women in the Astral study (95%) said the menopause had affected their skin, with half (45%) claiming dry skin was a real problem and 35% highlighting their face and body lacked lustre, with 30% seeing a loss in suppleness and increased dryness. Study respondents going through the change were asked to test Astral over a three week period to see how effective it was as an all over body moisturiser. Testers used Astral once or twice a day. Final study results revealed that 95% of users found Astral very effective in actually preventing dry skin, with 85% saying they found the cream soothing, hydrating and great at helping to maintain skin moisture balance. 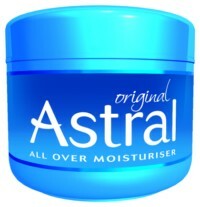 85% of the study correspondents found Astral more effective than their usual moisturiser. As a result trialists said they were set to continue to use Astral as a daily, hydrating body moisturiser. Commenting on this latest trial news from Astral, Dr Trisha Macnair notes: The menopause really plays havoc with womens skin and yet often goes unmentioned versus more dramatic symptoms. Falling oestrogen levels, which affect the production of collagen, is responsible for helping skin, hair and nails to retain their elasticity. As a result, thanks to the change, oestrogen levels fall and skin starts to sag, get dry and be less supple. The truth, as revealed in this report, is that when a womans facial skin is in good condition she feels more confident and more attractive, which can be a real boon when other parts of her body are potentially making her feel out of control. If the skin on her body is in good condition then she feels not only more confident, but also feels better because she is more comfortable. Astral cream was first launched in 1950 and for more than half a decade since millions of women have used this all-over face and body moisturiser, giving generations of women soft skin thanks to Astrals rich formulation. The formulation of the cream is the same today as it was when it launched. Astral is full of delicately balanced and nourishing ingredients which make it a perfect all-over moisturiser. It can be used every day to keep skin soft and supple and it can even tackle the driest skin on elbows and feet. Thanks to its versatility, Astral can also be used as an after-sun lotion and make-up remover. Astral is available in Boots, Morrisons, Sainsburys, Superdrug, Tesco and all good chemists. It comes in three pot sizes: 50ml  the handbag pot, which is perfect for on-the-go indulgence (£1.49); 200ml – with all the different uses of Astral, many women get a few 200ml pots and keep one by the bed, one in the bathroom, one by the kitchen sink or any place where Astral might come in handy (£4.19); 500ml – Astral prides itself on being a premium quality product with a great value price (£7.99). With the 500ml pot women get even more for their money. Tokyo: Japanese people are living longer than ever, with the average life expectancy now 86.05 years for women and 79.29 years for men, the country’s health ministry has revealed. The life expectancy of Japanese women increased by almost 22 days in 2008 from the previous year, while men added another 37 days, the ministry said. The longevity of the Japanese is attributed in part to a healthy traditional diet including fish and vegetables and an active lifestyle. But longevity is causing economic problems for Japan, which has one of the world’s lowest birth rates, leaving a shrinking working population to support a mass of retirees. London: UK scientists who questioned nearly 9,800 people over the age of 50 about their lives and found women were more optimistic than men. Examples might be actresses Meryl Streep, 59, Helen Mirren, 62, and Judi Dench, 72. Last year, Mirren said: “A weird thing happens to male actors, especially movie stars, in my experience. Researchers interviewed people born before 1952 at two year intervals. They found that the poorest fifth of the population were over twice as likely to have died by 2008 as those in the wealthiest fifth. The study found that exercise increases life expectancy with the physically inactive twice as likely to die before those keeping fit. Bejing: Chinese people are living healthier and longer lives as medical and sanitary conditions in the country have greatly improved, according to the latest report from the Ministry of Health. Residents’ average life expectancy, a key measurement of economic development and health care levels, increased to 73 years in 2005 from 71.4 years in 2000. In addition, the infant mortality rate decreased to 1.53 percent in 2007 from 2.55 percent in 2003. Last year, 36.6 people per 100,000 women died during pregnancy or childbirth, compared to 51.3 women per 100,000 in 2003. According to the report, the improvement in Chinese people’s health conditions was attributed to increased spending on medical care and enhanced medical services provided across the country in the past five years. In 2007, China was estimated to have spent 1.05 trillion yuan (US$144.43 billion) in healthcare, accounting for 4.82 percent of the gross domestic product, with the per capita medical expenditure standing at 781 yuan. The government is shouldering more of the medical expenditure in the past five years. Government spending, as a proportion of the country’s total medical expenses, increased by one percent from 2003 to 2006, while residents’ spending dropped 6.5 percent in the same period. As a result of increased investment in medical care, people are able to enjoy better medical services. By the end of last year, a total of 315,000 medical institutions were established, 24,000 more than that in 2003. The number of medical practitioners, including assistant practitioners, rose to 1.56 per 1,000 people in 2007 from 1.48 per 1,000 in 2003. The number of registered nurses per 1,000 people climbed to 1.12 from one nurse during the same period. The report adds China has made much effort to improve the public health and medical system in the past five years, covering maternity and childcare, disease prevention and medical insurance in both urban and rural areas. Since receiving his medical doctorate at the Paris Medical School in 1974, Dr Sister has let the International Beauty, Anti-Ageing and Nutrition community dip into his pool of expertise on many occasions. Dr Sister has practiced in the worlds premier surgeries, establishing himself initially in Paris before moving to Los Angeles to maintain the looks of Hollywoods elite and its most famous, (and scrutinized) celebrities. During his successes in the USA, Dr Sister took time to establish the HealthTech Institute, which has taken part in numerous activities in the USA, Canada, France, England, Ireland, Israel, Saudi Arabia and the United Arab Emirates to further our understanding of anti-ageing and beauty. His views on aesthetic maintenance and improvement are highly respected around the globe and subsequently has made numerous TV and press appearances in the USA, UK, France and Israel. He is also the author of six internationally recognised publications (with another on the way). Dr Sister is registered with Conseil de lOrdre des Medecins (France), General Medical Council (UK) and is an Associate Member of the New York Academy of Sciences. He is also a member of the American Academy for Anti -Ageing Medicine and British Association of Cosmetic Doctors. Fortunately for us, Dr Sister now resides in London, where until recently he has had a successful Harley Street practice. We are thrilled to have him consulting here exclusively at BeautyWorksWest. Feeling like you really need a little more involved help maintaining your health and beauty? Then Dr Sister is your man. With his Whole-listic approach to treatment he can address many issues from the inside, out and so can offer bespoke treatments that will leave you feeling like a whole new person in no time! With his broad field of expertise he can give you comprehensive treatments in Hormone Therapy, Age Management and Weight Management.